P.S. Thanks for the translator tip. 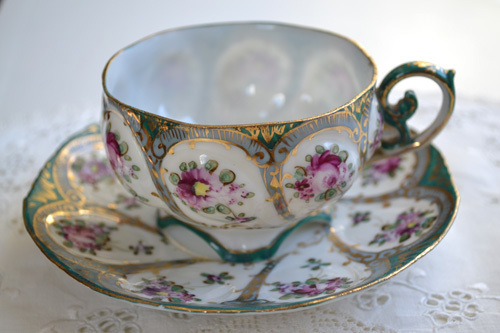 Oh, Terri that is one of THE prettiest teacups I've ever seen. What a wonderful bargain! I used to join in on the Teacup Tuesdays, every now and then, but kind of just let it fall by the wayside. Would it be okay if I posted one of my previous ones? I don't have that many teacups! Ohh LOVE the cup and saucer...I collect pretty ones from thrift stores and make candles in them! this one is particularly pretty isn't it? A lovely teacup! You are probably right...it looks Austrian or German to me. Thanks for the translator widget, I had been trying to find it to no avail!. What a beautiful teacup and saucer. It's just delightful. Thanks for sharing it. Terri, WOW ... who cares where this cup was made ... it's simply stunning! Love the color mix, the thinness of the porcelain, the beautiful handle ... there just isn't anything that isn't lovely about this cup. Thanks for the instructions for the translator. I've been wanting to add it. Happy Tea Day! 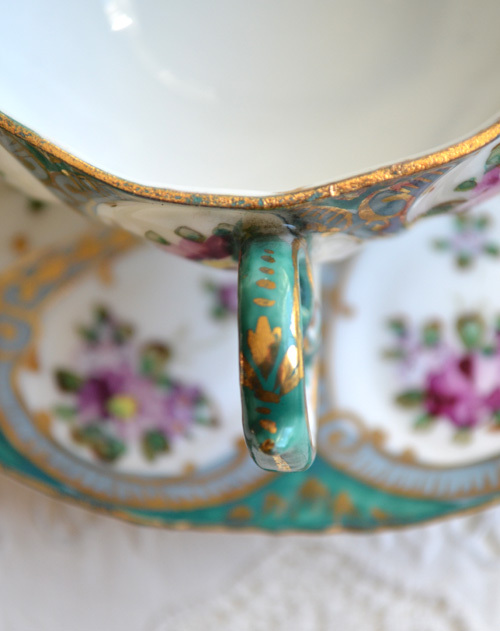 What a charming teacup, Terri, love the colours! I would love to see your collection. Thanks for sharing. Thank you for your comments on my teacup candles! Lovely Man actually went thrifting all on his own the other day and came back with four more pretties for me! Guess what I'm doing on my days off! Terri .." Bohemian" is the perfect name for this pretty cup... She is definitely unique ( Ha Ha)... the colours are fabulous....What a great find..ENJOY !!!!! Your cup is so so sweet, just like you Terri! I adore this color, and the gold highlights are gorgeous! What a beautiful cup and I love your description of it! The handle on it is so pretty! I don't know anything about cups so I cannot help you. Sorry! That bracelet you made took my breath away. I so love the colours you have chosen. 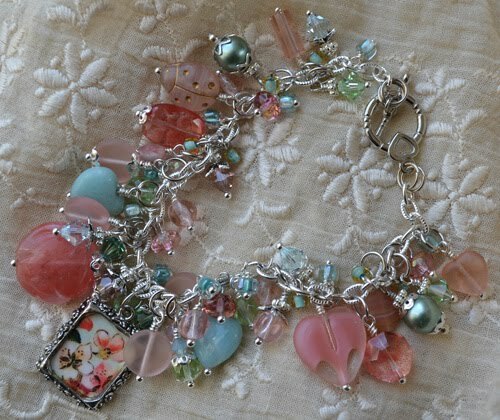 The winner of this lovely bracelet will be very lucky indeed! 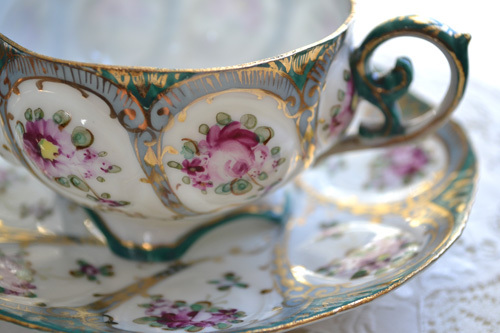 such a beautiful baroque teacup, lovely! Have a nice early springday! your new cup is "Bohemian", at least it looks so. Alas, I don't know anything about this cup except, that I love it. But maybe Maria Andrade knows something. She is an portugese china expert. I will give her a link to you blog. Your bracelet is really amazing and beautiful. Although I don't sign in because I already won a wonderful giveaway. Thank you for your kindness, for sharing this beautiful things and for hosting this sweet event. That is truly one of the most beautiful teacups Ih ave ever seen! It looks Bavarian to me. I love it so much, oh and your pictures of it are AMAZING! Your cup is another gorgeous beauty you spotted and brought home for a bargain! 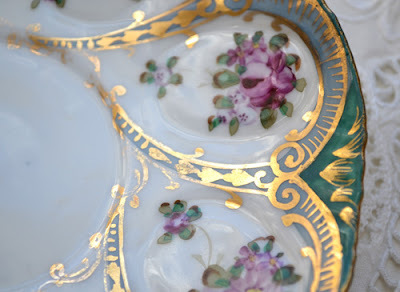 The hand painted details are beautiful! Unfortunately I can't tell you where it is from :(. The little dot could be a worker's mark but even that is uncertain. Judging from the very thin paste, I would say it's oriental, but using a European-type decoration. Enjoy it because you found one more treasure for your collection. parabéns você fez excelente aquisição! Lovely cup of tea this will hold. This is stunning! Tfs! Terri, it is amazing how many cups, you have collected ,dear- one more pretty as the other, and some so very fabolous. This is just so cute, with all the gold and lovely colours, and I like the 4 feets. Terri ,could I please have your adress,dear? -just want to send you a little something. She is exquisite! I love the design and the colors...very beautiful! She must feel wonderful in your hand. I am so late today! Sigh...life happens. I love your teacup. The colors are so lovely! Dear Terry I just found out your lovely blog and Im already in love with it. the last cup you ha found is really amazing. It's been a while that I'm looking for something like this. 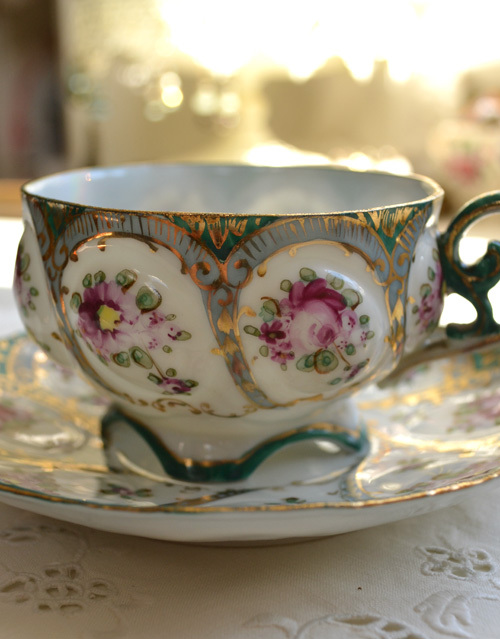 I really love rococo and fench style and this cup reminds me a lot Marie Antoinette's ones. Can I ask you some advices where to find theese levely items? Thank you very much. I'll follow you. Have a good day and congratulations for you new cup. Terri, I love your cup and what a find! It's gorgeous!! I haven't participated in Tea Cup Tuesday for a couple of weeks...my collection of teacups is small. I need to buy more so I can post about them! lol Sounds like a good reason to go to the thrift and antique shops, right?! Hope you're having a wonderful week. You've outdone yourself, Terri - lovely cup today - and totally Bohemian! A fun word that conjures all sores of fanciful artsy thoughts in pattern and design. Perfect description! My post is a bit off the beaten path this week - somewhat distracted. But, back on track next week as I'm gathering all things green for March and spring - we're getting an early one here and I can't be more thrilled! Thank you so much for visiting me to my blog, and also thanks for the chance to liking here. I missed Tea Cup Tuesday this week, but simply had to come back to see what everyone was up to. I am so glad that I did! 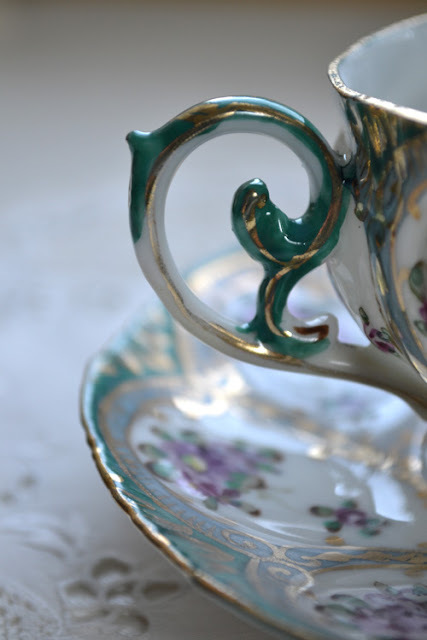 Your tea cup is enchanting. So much so, that I had to "pin" it. 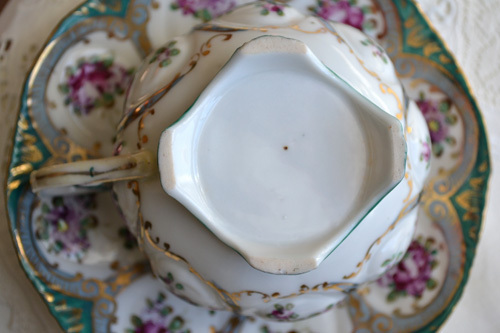 This teacup is just too beautiful to soak in. Lovely. Thanks for the instructions too...you are such a good teacher!